At first glance, making your own tack (or other hobby stuff) sounds like the perfect solution to a tight budget. If you are a talented, experienced crafter and have the tools already, it may be a great idea. However, if you are a complete novice and you want to compete in Open against veteran competitors now, instead of later, it may not be. Why? There are several reasons. The homemade tack may be poor quality. It may be incorrect. It may just be boring, getting easily overlooked in the today's competitive showring. To put this another way, how do you know if you should make your own tack instead of purchasing it from an established tackmaker? I've developed the following "questionnaire" to help you decide. Go through the list. If you answer "yes" to the majority of the questions, you should make your own tack. If most of your answers are "no," you would better off buying your tack. What is your purpose? Are you making play sets to enjoy yourself or for the kids to play with? If so, making your own tack, is loads of fun. I actually started out this way! Are you wanting to show? If yes, which is more important, winning or winning with stuff you made? Do you have the necessary knowledge? That is, do you know how tack should look? Do you know what forms of rigging are acceptable for western saddles? Do you know the correct placement of a noseband? If you do not know all these things, do you have access to this information? Are you willing to spend the hours necessary researching what is correct? Do you have the skill? Are you basically a creative person? Do you like to experiment, even if the result may not be what you wanted? Do you know how to work with leather, cloth, and beads? Do you learn new skills easily? Do you have the time? This is a biggie. Can you get your tack project done in time for that big show? Or could a tackmaker do the job faster? Do you have the money? What kind of a question is that? 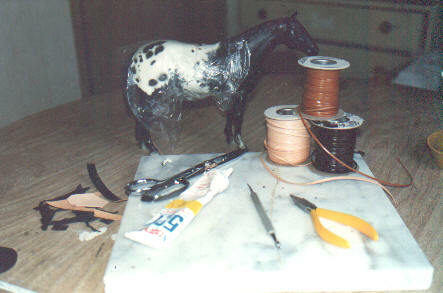 Making your own tack is suppose to be cheaper! Not necessarily. Look back over my partial lists of equipment and supplies. The stuff isn't cheap. The needle-nose pliers run about $10 each, pinking shears around $20, and leather tools can add up into the hundreds of dollars. The supplies are cheaper, but you have to count in the time and gasoline you spend finding the stuff. Do you have the desire? Do you really want to make tack, or are you just trying to cut corners? If you are just trying to save money, you won't. You will actually be wasting your time and your money making your own tack. You won't have the inner drive necessary to do a sensational job. Without that drive, your tack will be dull and commonplace. So, how did you do? Should you make your own tack? YES! Take me to the Catalog for KITS or TACK-MAKING SUPPLIES.